I was born and raised in Los Angeles. My father was an architect that designed custom homes for “the famous people” living here. I hung out with famous people’s kids when I was a kid. I got heavily involved in the music scene as a teenager, so the Sunset Strip was my second home. Rubbing elbows with celebs was just something I took for granted. It was just part of growing up here in the city of Angels. Starting out my career in Los Angeles, it was almost a “given” that any photographer based in LA would most assuredly want to shoot celebrities. But that just wasn’t the case with me. I loved shooting musicians, but other celebrities just weren’t my cup of tea. Every once in awhile, though, a gig will come up where I’m asked to shoot a celeb and I’ll take it. Last year I shot Nicole Murphy for VH1’s Hollywood Exes’ Reality TV show. Six months ago, I got the dream job of my career when I shot Perry Farrell from Jane’s Addiction. 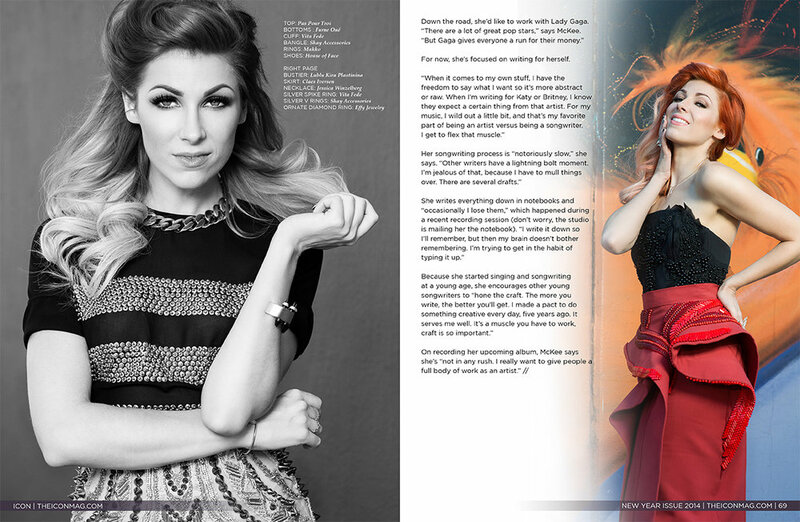 And just this last November my agent asked me if I’d like to shoot Bonnie McKee for Icon Magazine. Best known for her songwriting collaborations with Katy Perry, Britney Spears, Christina Aguilera, amongst others, Bonnie is also a singer, songwriter and actress in her own right. Her second album is set to be released this Spring and she’s quickly rising to pop stardom! I liked what I read about her and decided it would be a fun shoot. My agent also thought that Icon Magazine’s editor in Chief, Casey Geren and myself would really love working together. So I decided to accept the assignment. Bonnie is as personable as she is pretty. Her flaming red hair with the Pretty in Pink tips and her lovely spirit made the shoot just simply, fun! She loves the camera, and of course, the camera loves her! When I am in LA, I live on the East side, in the hills of Silverlake/Echo Park. So we took advantage of my colorful neighborhood and shot on location just down the street from my house. Utilizing the amazing graffiti art that dominates my hood, Bonnie worked the artful backdrops like the pro that she is. I had one of my LA assistants, Chris Evan, come out to assist me on this shoot. We used an external flash to bounce some light onto Bonnie. We put a soft box on a Speedlight and used it as a soft fill light with available light. I like shooting this way, letting the available light be the key light source and filling in the shadows with some flash fill. Everything was shot on my Nikon D800 with either my 24mm or 85mm lens.